This was really tasty, and really quite quick! A few days ago I promised you a recipe. I had posted about sun-dried tomato sausage and had hinted at something to do with it. Well I did do something with it. We had this recipe for dinner that night. I always try to be as good as my word. It may have taken a few days to post this recipe, but here it is. Better late than never. 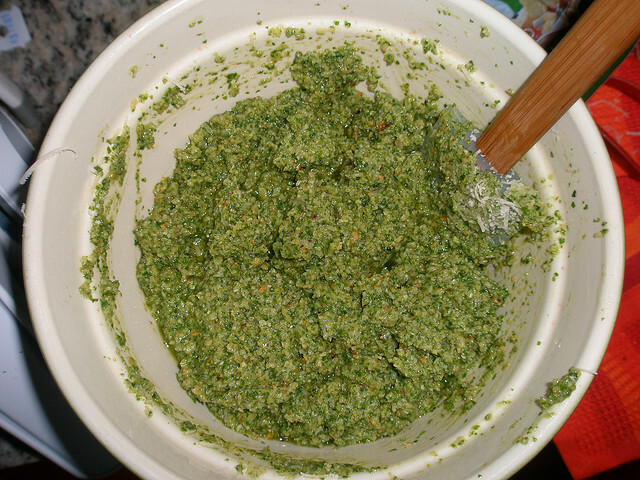 Making your own pesto is really quite easy. You can prepare this recipe and stuff casings, or do as I did and use "loose" sausage meat. Simply roll the meat into small meatballs and fry. Presrved sausage of any kind won't roll. Due to the preservation it is already "partly cooked." You can substitute smoked, dried, or cured sausage if you opt to take the extra step(s). You'll just have to make do with slices of sausage as opposed to meatballs. The longest task in this recipe is rolling meatballs from 1 lb of sausage meat. Put on the TV and forget what you're doing. 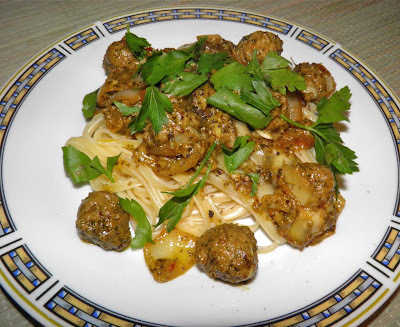 Due to the ingredients in the original sausage recipe these meatballs are very "soft" and tender. It was actually quite an unexpected bonus. This recipe was inspired by a quickie dinner I make with shrimp, tomatoes and artichoke hearts. The marinated hearts add a nice piquancy against the sweetness of the other ingredients. This is quite a quick recipe for a weeknight dinner. With a (God forbid) jar of pest sauce it really comes together quickly. A note: I made four sausage patties from this mixture. I served them with mayonnaise, onion slices and lots of fresh basil leaves on hamburger buns. They were actually so good that I would make this sausage meat solely to have burgers on the barbecue! Give them a try! minute, just long enough to let it heat through. 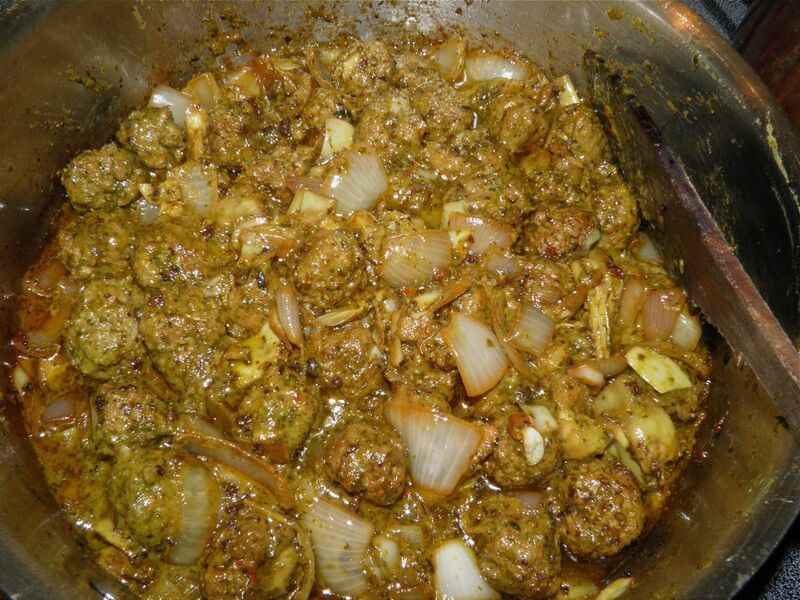 Take small pieces of the sausage meat and roll into small meatballs. Each should be about 3/4 to one inch round. Wet hands help the process greatly. Cook the linguine, according to the package directions, while you make the sauce. Heat the olive oil in a skillet. Fry the meatballs for about 5-6 minutes. Be careful as they will be very soft. Remove to a plate. Add the onions to the pan and fry for 3 minutes. Then add the garlic and fry for a further minute. Deglaze the pan with the white wine, scraping the brown fond from the bottom. Add the chopped artichoke hearts and meatballs and bring back to a simmer. Toss the meatball mixture with the pesto in the pan and keep warm while the pasta finishes cooking. Drain the pasta. Serve the meatballs on top with a scattering of the torn parsley. If you like this post retweet it using the link at top right, or share using any of the links below. Questions? Comments? Derogatory remarks?